To place a call, hover over any contact and click any of the calling options or simply click the dialpad icon on the left to enter a phone number to call. 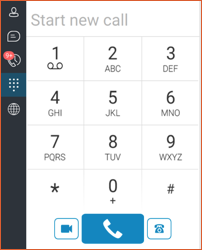 To use the dialer above, start typing a phone number or click each digit on the dialer. Choose either the video camera at the bottom left to place a video call from your client, the middle larger button to place an audio call from your client, or the desk phone icon on the right to place the call from your desk phone. If you use the desk phone option, the system will call your desk phone first. When you answer, the call will be placed to the number you called. This is convenient for avoiding mis-entered calls on your desk phone as the phone system does the dialing for you.